Now that you have found the right makeup for your skin, using the Part One of the Makeup Guide, it’s time to get to the fun stuff...applying makeup! Whether you are looking to conceal blemishes and achieve a natural finish, or go all out with a dramatic look, these basic application techniques are practiced by some of the most popular makeup artists and are a cinch to master with some patience and practice. First things first: cleaning your brushes. No great work of art was ever created without the use of proper tools. Applying makeup is no different. Be sure to select the appropriate size and shape brush for each step and product. 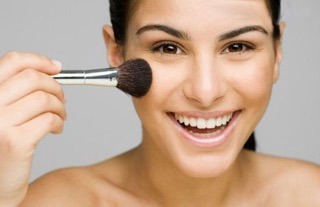 Using a clean brush to apply concealer, foundation, and powder is absolutely essential for those who live with acne. Dirty brushes are a breeding ground for bacteria. Ideally, clean your makeup brushes at least once a week. The process is simple and brief. Rinse brushes in lukewarm water, being sure to wet only the bristles. Pour a small amount of baby shampoo, or other gentle cleanser such as mild dish soap, into the palm of your hand, swirling the wet brush bristles. You will see makeup and build-up beginning to remove itself from the brush. Run under lukewarm water, repeating the previous step until the brush is clean. Squeeze any water from the bristles, reshape the brush and lay it overnight on a paper towel to dry. This technique will keep your brushes clean, keep bristles healthy and soft, and help avoid any unnecessary irritation of the skin. Once your face is clean and you have applied moisturizer and/or sunblock, you are ready to apply your makeup. The four items listed here are only intended to conceal any blemishes and create a smooth canvas. This will allow you to proceed with any blush, contour, or highlighting should you choose to venture into that arena. Primer. A primer does just that-it primes bare skin to be covered with additional layers of makeup. After washing your hands, squeeze a small amount of primer onto the fingertips and apply to the skin, rubbing in gently. Primers can work wonders, forming a lightweight bond between the skin and any foundation you may apply later, but can also be heavy at times. When possible, opt for a water-based primer over a silicone option. Concealer. Concealer can be found in the makeup kit of just about anyone looking to cover red, irritated pimples. For covering inflamed spots, opt for a concealer with green or yellow undertones to combat any redness. Using a small concealer brush, apply a thin layer of concealer to the pimple, and surrounding area. Be sure not to get heavy handed as concealer tends to cake and crease when too much is applied. Dab into the skin with a beauty blender or other makeup sponge. The beauty blender is the secret weapon of many acne-prone makeup wearers and makeup artists. If it does not appear to be fully concealed at this time, just sit tight-more can be added over the next layer. Foundation, tinted moisturizer, BB cream, or CC cream. Any of these creams can be applied to achieve a fuller coverage look on a larger area of the skin, depending on what works best for you and what you are trying to achieve. Tinted moisturizers offer very light coverage, while foundation is used to reach a fuller effect. The emergence in popularity of BB and CC creams in recent years provide additional options, and come with added skin care benefits such as SPF coverage and anti-oxidants. Heavier than a tinted moisturizer yet lighter than a foundation, these creams are perfect for those looking to achieve an everyday look. Use a foundation brush to apply any of these formulas onto the face, then dab into the skin using your beauty blender or makeup sponge, making sure to blend into the hair and jawlines to create a seamless finish. Concealer touch up. After your product of choice has been applied to the rest of the face, go back over any visible red spots using the same technique from Step 2. Powder. Powder is the final step in achieving a flawless finish on the face. Loose mineral powder tends to be best for acne-prone skin, as the opportunity for bacteria to linger on the surface of a pressed compact of powder is more prevalent. However, as with anything, go with what works best for you. The importance of starting with a clean make-up free face will help you achieve maximum results. While concealing existing blemishes is much easier through the power of makeup, treating the source of the problem is the only way anyone with acne will enjoy a real change. Certain types of blemishes such as cystic acne and whiteheads are impossible to cover even with the most professional makeup formulas. Targeting and treating the source of your acne with AcnEase® will save you precious time, money, and trouble in the long run. Although it can take as long as a few months for AcnEase® to yield the desired results (most users see results within the first month), simple makeup tricks and techniques such as these are intended to hold you over in the meantime. AcnEase® is your best defense for healing your skin and eliminating future acne. It addresses the direct causes of acne, counteracting the effects of hormonal imbalance and the overproduction of sebum, stunting the acne cycle. With AcnEase®, you will look and feel better from the inside-out whether you choose to wear makeup or not. What about you? What are some of your favorite makeup tips and products? Tell us in the comments below!